First the good news: There has been a steep climb in the number of registrants for Overseas Absentee Voting (OAV) within the jurisdictional area of the Los Angeles-based Consulate General of the Philippines. When the registration process was started in 2003 the registrants reached a total of 402. The current registration period from Oct. 31, 2011 has seen that number rise to 29,639. At the rate registration is growing and if sustained, in 5-15 years we may have 100,000 registrants, said the consulate officer-in-charge, Deputy Consul General Daniel R. Espiritu. Registration ends in the last day of this month. Unfortunately, however, the eagerness of countrymen to participate in Philippine elections through OAV registration has not been matched with identical attitude in the voting itself. Only a very few actually voted, OIC Espiritu said. That in essence is the justification for House Resolution No. 2807 filed by Batangas Representative Hermilando I. Mandanas. It urges the Philippine Commission on Elections, the Department of Foreign Affairs, the Overseas Workers Welfare Administration, the Philippine Overseas Employment Administration and other national line agencies, civil societies and political parties to undertake activities to encourage all qualified Filipino voters to register and vote during the 2012 National Elections. 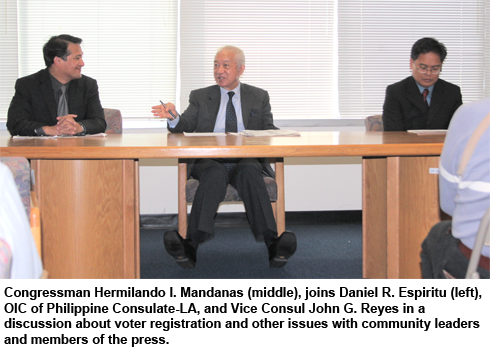 Congressman Mandanas was at a scheduled meeting with community leaders and members of the press held at the Conference Room, Philippine Consulate General, evening of October 18. He arrived in Los Angeles the previous day and will be going next to San Francisco and other places for the same objective: To get the Filipinos overseas active in the voter registration process especially that there is only a short time left to do so. “I have filed a bill regarding this (voter registration) that’s why I’m gathering information in aid of legislation,” the congressman said. Overseas Filipinos are not expected to go to the Philippines for the purpose of attending congressional hearings that’s why he has to come here instead, he said. Espiritu also voiced out the need to involve community leaders to disseminate the information and educate the people about OAV. But most of all, he said, there is a need to break the apathy of our people regarding elections although he clarified that it is not only in Philippine elections that our people don’t participate. “Even when they are already American citizens, they still don’t participate in elections here. We really have to break this negative attitude because without voting, we won’t acquire the voice necessary in the fight for our advocacies that would benefit our countrymen,” he said and adding that American officials know that while there are many of us, many don’t register/vote and that fact translates into a tiny voice in community affairs. There was also a discussion about the possibility of voting online. It would be a great development if realized. However, there are still technological and legal barriers to overcome. It’s okay as far as the U.S system is concerned because the government is interconnected. Your biometric data here, for exaple, is shared by the DMV, Homeland Security, Pentagon, FBI, civil registry and other major agencies of the government. We don’t have that kind of infrastructure in the Philippines. Some discussants noted that some factors discourage prospective registrants. One of them is the requirement for registrants to signify intent to return to the Philippines. It would be best if such a requirement is eliminated. However, it was noted that no registrant has so far been cited for violating that constitutional mandate. Vice Consul John G. Reyes also informed that the requirement is only for immigrants. It does not apply to dual citizens, he said. There are decided cases relevant to the issue of dual citizenship, among them: Schneider v. Rusk, 377 U.S. 163 (1964); Afroyim v. Rusk, 387 U.S. 253 (1967); and Action and Deltamar v. Rich, 951 F.2d 504 (2nd Cir. 1991). Rep. Mandanas said that it is important to find ways to improve the dual citizenship law; how to educate the Filipinos to make them appreciate that voting is a right; and to inculcate the idea that involvement in the voting process is a way of participating in good governance in the Philippines. The legislator said that citizenship allows one to own properties without restrictions in the homeland. Many have gone back to the Philippines for that purpose and because of the financial downtrend in the U.S. OIC Espiritu chimed in: “Malaki-laki rin ang marating ng sahod mo o kaya SSI duon sa Pinas (your pay or SSI would go a long way in the Philippines). He also informed that there is an agreement between the Philippines and the U.S. to prevent double taxation on incomes.